We sell Natures Aid products like Nature's Aid Beta Glucans Immune Support + - 30 tablets online in the UK and directly from our award-winning store in Scotland. Natures Aid Beta Glucans Immune Support is an advanced formula to help support the body's Immune system. Vitamin A, Vitamin D, Vitamin C, Zinc, Copper and Selenium contribute to the normal function of the immune system. Where can you buy real Beta-Glucans Immune Support safely online? If you are wondering where you can buy Nature's Aid Beta Glucans Immune Support + - 30 tablets safely online in the UK, then shop with us. 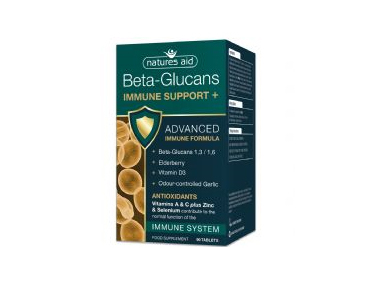 Beta-Glucans Immune Support - Nature's Aid Beta Glucans Immune Support + - 30 tablets in Immune Support and Herbal Remedies, Tinctures & Supplements.